If I were to pin my hopes on the next big thing, it would be BBQ food, in Dublin. 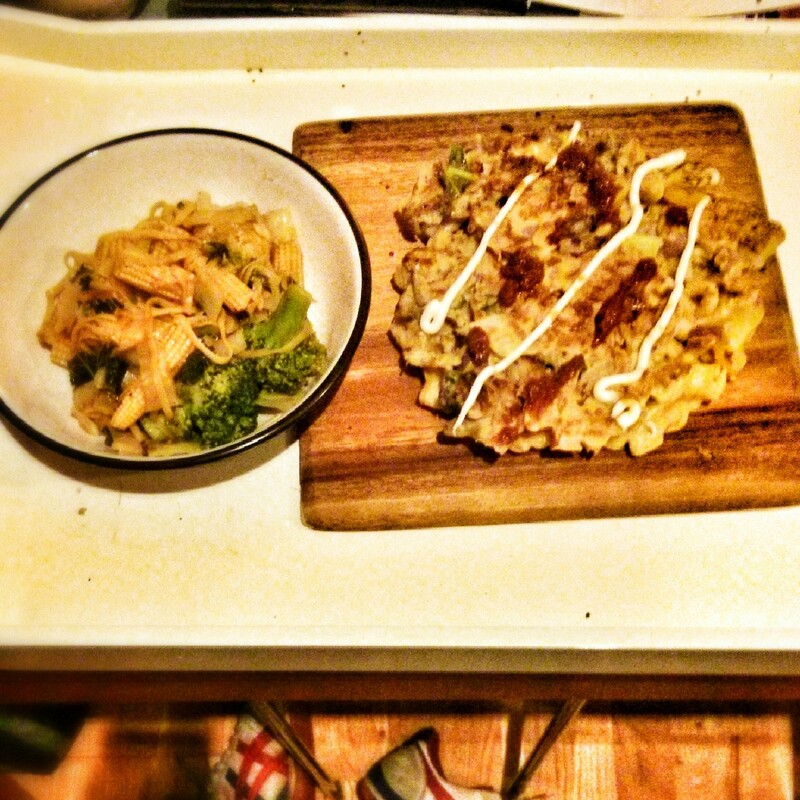 But there’s a little hidden trend kicking off and it’s a little known Japanese dish called Okonomiyaki, a savoury pancake. It’s very simple, quick and easy to make – but hasn’t quite hit here yet. There’s a place in London where you can get a good version, I’ve also given it a go on my travels and it’s such a satisfying dish. Literally, Okonomiyaki means ‘What you like’ so the combinations are endless, and every region in Japan has it’s own version – filled with everything from seafood, to vegetables or pork. This is a simple, year round kind of recipe which can really wow, but doesn’t break the bank, or wreck your kitchen! Perfect on its own as you can make them quite big, and they’re deceptively filling, if you really want, a simple bowl of fried noodles and some veggies is a great side, gyoza would be more traditional. First off, peel and slice the onion, mushrooms and cabbage (a small blender to roughly chop will make quick work of the cabbage). If using frozen prawns, leave them out to defrost in a bowl of water, if using raw give them a quick fry to just cook them (we prefer to err on the side of caution). In the mixing bowl, whisk the eggs and flour together until you get a nice, smooth batter. Then fold in the vegetables and prawns until well combined. You really can use any vegetable though, just make sure you choose something not too big and won’t be too crunchy, you can also use any meat you want, we also threw in some bacon. Put a good glug of oil into the pan on a good medium heat. Once nice and hot, pour half the mixture into the pan, cooking about 5 minutes on either side, until browned and steady enough to flip. Just make sure that it’s cooked through. When cooked and browned on either side, slide out onto a plate and drizzle with ketchup (or brown sauce) and mayo. If you’re a traditionalist, you’ll have to sprinkle with fish flakes, but that’s a bit too fancy. To add some spice to the dish, which is solidly flavourful – but sometimes needs an oomph, get a tsp of Harissa Paste and mix well with a small bowl of yoghurt, adding more/less of each to taste. Serve with some nice fried noodles.